HURRAY! I got some good news today. 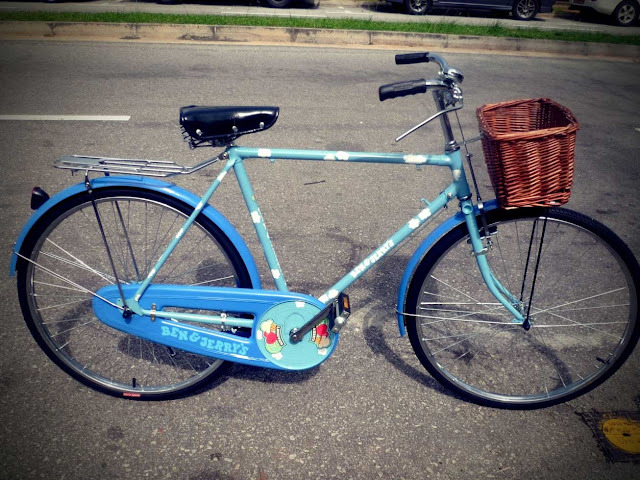 Camemberu is one of the two lucky blogs (out of 15) that have the honour of giving out the Ben & Jerry bicycles! Thank you to everyone who commented. It's all because of your effort that we got chosen! I asked hubby to choose the winner from the comments. Unlike me, he doesn't personally know anyone who commented, so I figured that's the most objective and unbiased way. So congratulations to Colin! This is his winning entry, and it's quite a heartfelt one. "I'm trying to win this bike for my girl as an anniversary present. Happy anniversary, you two! Mine's coming up too, but even though I can't have the bike myself, I'm very glad to be able to make it happen for you. Thanks for leaving an email address. I'll be in touch. congrats Catherine and Colin :) .. this contest is fun ! Have a great anniversary celebration with your hubby as well! And to all the wonderful folks who commented, thanks for the encouragement and kind words!